The Department of Homeland Security is investigating whether one of its employees changed Wikipedia pages for House Majority Leader Kevin McCarthy and Rep. Renee Ellmers alleging that they had an affair. "DHS has immediately launched an investigation into this serious matter. If it is discovered that a DHS employee, using Government property, is responsible for these alleged actions, immediate and appropriate disciplinary action will be taken," said DHS spokeswoman Marsha Catron. DHS discovered a day earlier that changes made to the lawmakers' Wikipedia pages were tracked to an IP address at the department's office in Springfield, Virginia. Aides to McCarthy, R-California, and Ellmers, R-North Carolina, have declined to talk to reporters about the allegations and the two members themselves have reportedly vehemently denied the rumor. 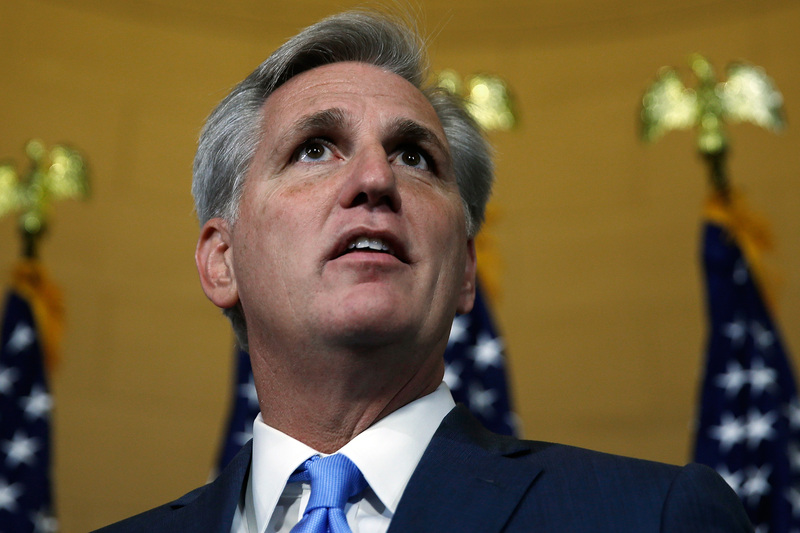 On Thursday, McCarthy dropped out of the race to become the next House speaker. Members said he would not have been able to secure 218 votes on the floor to take the gavel. Earlier in the week, Rep. Walter Jones, R-North Carolina, sent a letter to House Republican Conference Chairwoman Cathy McMorris Rogers, R-Washington, warning that any candidates for speaker with "misdeeds" should withdraw from the race. Jones referred to former Rep. Bob Livingston, R-Louisiana, who stepped down before he was expected to become House speaker. After a closed-door conference meeting Friday, Jones was asked if he thinks his letter had an impact on the leadership race. "I would hope not. How can words asking for integrity create so much trouble?" Jones told reporters. "I don't think so, to be honest with you." Another reporter charged that the rumors swirling about an alleged affair between McCarthy and Ellmers emerged because of Jones's letter. "That's their decision to interpret it that way," he said. "Anybody in leadership, male or female, should be a man or woman of integrity. That is nothing personal about anybody." On Friday, Republicans said it's still not clear who will become the next speaker. Rep. Darrell Issa, R-California, told CBS News that Rep. Paul Ryan, R-Wisconsin, would be the "consensus candidate." Congress will be on recess next week for the Columbus Day holiday.